This sauce originating from the Canary Islands was introduced to me by Galician sister-in-law, who lived there for many years and told me I had to make it after returning from the farmer’s market with a bag of the cutest, sweetest, tiniest potatoes. She said it was the perfect combination with boiled, salty potatoes known as Papas Arrugadas. I then fell down a YouTube hole watching endless (mostly homemade) tutorials of real Canarios making their beloved Mojo until I felt I could replicate it, even in the kitchen of my van. While its bones are bare and rustic, it is a perfect example of simple ingredients being put together to have a massive impact in the flavour department. It’s served with ‘wrinkled potatoes’ or Papas Arrugadas and together with the sauce we could think of this combination as the exotic, spicy cousin of the popular tapas dish, Patatas Bravas. This simple, rustic dish originates from the Canary Islands where potatoes have been farmed for centuries and take the Native American name Papas, as opposed to the Spanish Patatas but will surely remind you of the classic tapas dish served at every tapas bar in Barcelona, Patatas Bravas. In this recipe however, the potatoes are boiled, not fried, in heavily salted water. Traditionally they were boiled in sea water (this is definitely not for low sodium diet followers). Choosing fingerling potatoes, baby chats or some other soft waxy and small potato will make this dish sing with comfort, so choose your potatoes wisely. The sauce is spicy and rich, and in this case handmade, no food processor required, although you could if you like. I have adapted this recipe for a quick holiday tapas-style dish or simple lunch. Using a cleaver to mince all the ingredients is a bit messy but quick, you could also use a mortar and pestle if you prefer. 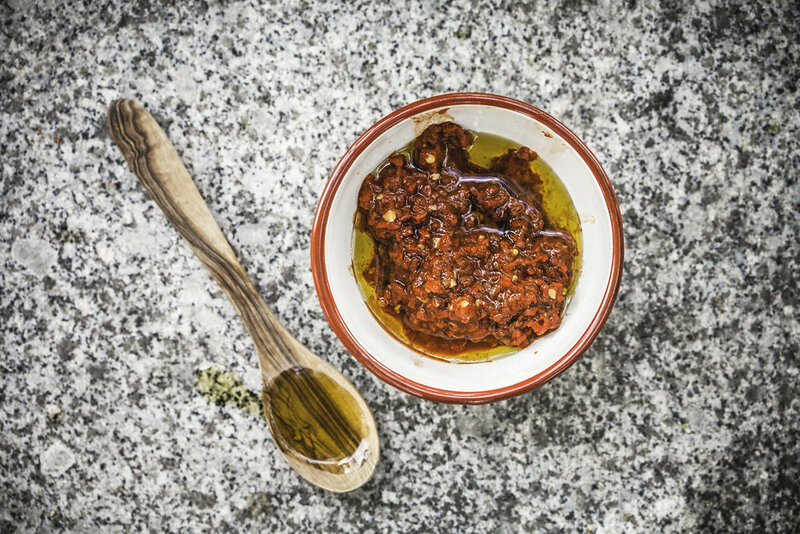 It is a fun sauce to make if you don’t mind getting your hands a little dirty and want a salty snack, full of flavour within a short space of time. It is an easy pull together from pantry staples (keep a jar of roasted peppers on hand!) and great if people drop by unannounced for drinks and nibbles or if you find yourself in a spontaneous gathering whilst camping ( isn’t that the best?). It is great if you can roast the peppers over a fire for extra smokiness, but I find using peppers from a jar super convenient when cooking on the road. 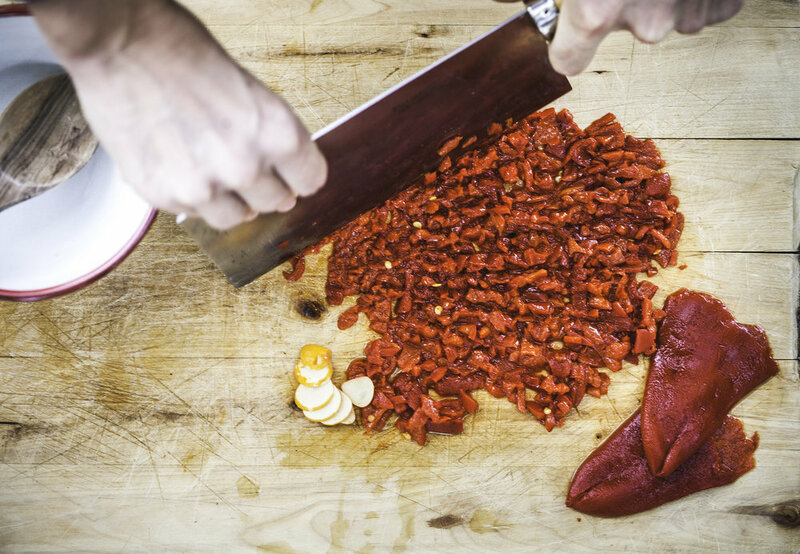 Chop peppers on a large cutting board, adding in garlic and spices once you have broken down the flesh to small pieces. Use the cleaver with two hands and dice all the ingredients together until a chunky paste forms. Scoop everything up and put in a bowl, add olive oil, vinegar and sugar and give it a good stir. Serve with Papas Arrugadas (see recipe below) or store in an airtight jar for up to 1 week in the fridge and use whenever the taste for a little tapas hits. Goes well with roast veggies or large grilled field mushrooms. Wash baby potatoes well, remove any eyes and put them in a pan with coarse salt, cover in water and put on the lid. Bring to boil until the potatoes have softened, check by pricking them with a fork. I used very tiny ones and did not need more than 15 minutes. Drain the water and leave to dry with steam (in less than 1 minute they will be dry). Return the pan to the fire. When it is hot, add a little salt and pepper. On medium/low heat allow the skin to start wrinkling, slowly moving the potatoes around. This should take you less than 2-3 minutes but be careful because if the flame is too high, the skins can burn. A layer of salt should be seen on the skin of the potatoes. Remove from the heat and serve with Mojo Picón on the side in a bowl. A perfect Canarian tapa at your campsite. If you like these cute enamel plates from Ibili Menaje España, shop them here and here. We love them for camping and #vanlife food, they are indestructable!